Hello everyone, hope you are well. I am currently watching re-runs of 90210, whilst staring at my bedtime table and my Jo Malone candle. I am so obsessed with it at the moment and I'm not sure why. It maybe because I've never had anything that nice in my room before and i just love the way it looks. This week has been slow and tiring. A long work week and a slow weekend, which I'm not really complaining about. I've got a lot to look forward to in June and not much time to prepare myself for it also a bloody big lack of money. I have also started a new blog with my cousin, Steph. We wanted to start a blog together as we are both bloggers as we thought we could be quite unique with it. I spent most of yesterday setting it up and getting all of our social media platforms set up all links below. I have been obsessing over instagram both on my own account and our new account. 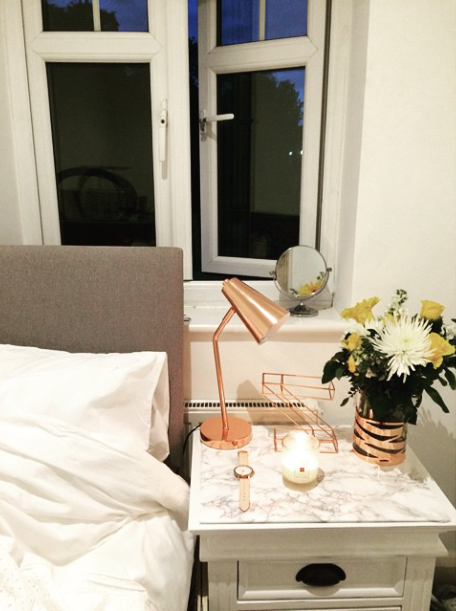 I love all of the rose gold touches next to your bed! gorgeous!